These are a few of the milder responses from present-day residents of Las Hurdes, a remote part of northern Spain, to the documentary that Luis Bunuel made in their backyard in 1932. Land Without Bread painted a world of poverty and disease. Bunuel’s camera caught images of goitred women and ravaged old men, of dead babies, deformed midgets and in-bred cretins. It showed a region without basic amenities – roads, electricity. Most of the Hurdanos, Bunuel claimed, had never seen a loaf of bread. Last year, documentary-maker Ramon Maria Gieling retraced Bunuel’s footsteps to Las Hurdes. His plan was to screen Land Without Bread in one of the villages and ask the locals what they thought about the movie that has come to symbolise the area. No sooner had he arrived than he received death threats. Gieling was startled by how passionate young and old Hurdanos alike were about Land Without Bread. 70 years on, they were all still smarting – whether or not they had seen the movie. They have good reason to be upset. Much of Bunuel’s “documentary” was staged. Look closely at the famous scene of the goat tumbling to its death and you’ll see a puff of smoke on the right of frame. The mountains of Las Hurdes were so treacherous, Bunuel claimed, that not even goats could negotiate them, but when an animal failed to fall down a cliff on its own, he helped it along with a gun. The scene showing a donkey stung to death by bees was also contrived. One Hurdano alleges that the filmmakers smeared an ailing donkey with honey and then knocked over two hives beside it. As for the dead baby, she looks suspiciously as if she is just asleep. For all its distortions, Gieling is convinced that Land Without Bread had a positive effect on the lives of the Hurdanos. Land Without Bread was made during the Republic, a time of progress in Spain. Politicians on the left were as infuriated by it in 1932 as the Fascists were a few years later. “It annoyed them because it was made at a time when they were trying to bring basic sanitation to Las Hurdes,” says Variety’s Spanish bureau chief, John Hopewell, author of Spanish Cinema Post-Franco. The film is seen as the third part of Bunuel’s great surrealist trilogy, which began with the films he and Salvador Dali co-directed – Un Chien Andalou (1928) and L’Age d’Or (1930). Unlike his erstwhile partner, Bunuel had a social conscience. In 1932 he broke with his surrealist cronies and joined the Communist Party of Spain (PCE). Around this time, he read a book about Las Hurdes, written by the director of the French Institute in Madrid. As he recounts in his autobiography, he was fascinated by the idea of the mountain wasteland bypassed by the 20th century. The funding for the documentary came from his anarchist friend Ramon Acin, who had promised to produce the movie if he won the lottery. “Two months later he won and he kept his word,” Bunuel wrote. The budget ran out faster than expected, and Bunuel was left to edit the film with a magnifying glass and scissors on his kitchen table in Madrid. Land Without Bread reached Britain in 1937 and was reviewed in the arts magazine Night and Day by Graham Greene, who described it as “an honest and hideous picture”. As far as the Hurdanos interviewed by Gieling are concerned, the film was anything but honest. “Bunuel shot it more or less from the scenes in the book [he had read on Las Hurdes],” says Hopewell. “It was a documentary at one stage removed.” Nevertheless, many believe that his representation of Las Hurdes is accurate. “He portrayed the nature of the area well. The irony is palpable. The Hurdanos have spent 70 years complaining about the “black legend” that Bunuel created around them, but their own tourist board wants to perpetuate the myth that this really is the land that time forgot. The title of Gieling’s documentary seems extraordinarily apt. In 2001, it seems, the Hurdanos are still The Prisoners of Bunuel. It goes without saying that music is a complex subject. The strong feelings invoked, the interpretations and the influences that a particular piece has are almost infinite, especially when dealing with one of the masters of the art such as Johann Sebastian Bach. Erbarme Dich – Matthäus Passion Storiesattempts to unpack this subject, making a study of the titular Erbarme Dich and Bach’s St Matthew Passion. The film’s field of investigation is wide, looking into not only the piece itself, but the experiences of those moved by it. The complexity of the music is mirrored in the complexity of the film, its purview of reactions reflecting the intricacies of Bach’s music. Its basic essence is a series of interviews with artists moved by Bach’s Passion, punctuated by excerpts from the work. This may sound simplistic, but the interviews cover a wide range of subjects, from abortion to loss of faith, from religious reactions to homosexuality. In a post-film interview, director Ramón Gieling discussed how he sees the suffering of Christ portrayed in Bach’s Passion to be comparable and relatable to all human pain, and this universality is very apparent within the film. This is especially noticeable in the sequences of the film’s chosen audition of the St Matthew Passion – a selection of homeless people. Their reactions to the piece and its relationship with the hardship in their lives is highly moving, and certainly warrants their otherwise unusual appearance in the film. Each of these interviews, and the performance of Bach’s work, are fraught with emotion, but it is their connections that are the most interesting and innovative aspect of the film. None of the sequences are particularly linked to the next, except thematically. An interview about a hardship in someone’s life is followed by a transcendent piece of music, then another completely different interview; a rehearsal; a montage of real-world images. The Passion and its themes are what connect these disparate segments, while the constant change gives the film an almost stream-of-consciousness experience. Gieling claimed to be highly influenced by the films of Jean-Luc Godard, and the same sense of narrative freedom seen in Godard’s later works is evident in Erbarme Dich. This should not, however, be taken as a warning for those who find some of Godard’s work impenetrable, as Gieling’s film is far more interested in emotion, and is thus a more accessible piece. Erbarme Dich is overall a unique and interesting film. Its structure is innovative and intriguing; its themes and content are wide-reaching and moving. While the screening I attended was a one-off festival showing, when the film receives a wider release I will definitely return to it, and I would recommend you all to do so as well. While it is not perfect, its imperfect beauty is still highly emotional and engaging. Duende (1986) Regie en scenario: Ramón Maria Gieling. Camera: Goert Giltay. Montage; Jan Wouter van Reijen Geproduceerd door Frans Rasker Met: Salvador Vega, Fernando Quiñones, Luis Agujetas, Familia Amador, Alfonso del Rio, Catherine ten Bruggencate e.a. Het verhaal gaat dat de wonderbaarlijk mooie flamenco-zangeres Pastora Pávon, die luisterde naar de bijnaam La Nina de los Peines (Het Meisje met de Kammen), ooit optrad in een kleine kroeg in Cádiz voor een gezelschap die al menige flamenco had beluisterd. Ze had een schitterende stem, een ‘stem als vloeibaar metaal’, zo stelt Federico Garcia Lorca, die het verhaal vertelt. Maar hoe schitterend de klanken ook waren die ze uit haar stembanden toverde, het publiek bleef stil. Geen enkel olé, geen teken van goedkeuring. Sterker, één keer klonk vanuit het publiek het beledigende ‘Viva Paris’, alsof, zo stelt Lorca, degene die dat riep wilde zeggen, ‘Hier geven we niet om bekwaamheid, techniek of meesterwerken. Hier geven we om iets anders.’ Maar Het Meisje met de Kammen kreeg men niet zomaar klein. Zij richtte zich op, spande zich, als- of zij diep vanuit de aarde van dit Andalusische land iets probeerde op te zuigen, iets dat haar bloed én haar stem kon laten koken. Ze ‘begon te zingen zonder stem, ademloos, zonder subtiliteit, met brandende keel, maar… met duende. Ze slaagde erin het geraamte van het lied kwijt te raken, om vrij baan te geven aan een furieuze en brandende duende.’ En natuurlijk herkende dit publiek, voor wie slechts magische emotie telde, dit moment waarin de zangeres het ge- vecht levert met haar stem, haar li- chaam, haar ziel, om in de klanken die zij als het ware uitbraakt, iets duisterder, dieper, universeler uit te drukken dan ooit mogelijk is met de meest perfecte stembeheersing, de grootst mogelijke technische virtuo- siteit. En het publiek moet zijn uitgebarsten in een euforisch olé, olé La Nina de los Peines. En het publiek deelde in de emotie, in de duistere kracht die men duende noemt. De Spaanse dichter en toneelschrijver Federico Garcia Lorca vertelt dit verhaal in een lezing die hij in 1929 schreef onder de titel: ‘Theorie en functie van de duende ‘. Hij probeert hierin ervaringen zoals die in de kleine kroeg in Cádiz plaatsvonden en waarvoor in de Spaanse taal het woord duende bestaat, te beschrijven en te analyseren. Ramón Gieling vertaalde deze tekst in 1984 voor het tijdschrift Wolfsmond en toog in het najaar van 1985 met een filmploeg naar Spanje (Madrid, Sevilla, Cádiz) om met de lezing van Lorca als leidraad op zoek te gaan naar dit magische begrip duende. Duende, een moment van duistere en magisch kracht in een kunstwerk of vertolking. Duende, een begrip waarvan Gieling ons in de eerste titelkaart van de film al meedeelt dat het als eigenschap heeft dat het zich niet laat uitleggen. Duende, in zijn meest authentieke vorm geworteld in de zigeuner-vertolkers van de flamenco-zang en -dans en het stierengevecht. ‘Duister’, ‘magisch’, ‘niet uit te leggen’, ‘een romantisch ideaal van de zigeuner’. Met deze ingrediënten kan een vertoog over de duende snel een semi-poëtisch, gesloten, eindeloos metaforische kakofonie opleveren. Zowel Lorca als Gieling in zijn voetspoor, stellen zich een bijna onmogelijke opdracht: zij proberen iets te begrijpen (en over dat begrijpen iets mee te delen) dat hen steeds weer (woord na woord, filmbeeld na filmbeeld) zal ontglippen. Het intellect, de verstandelijke reflectie, schiet te kort om deze bestaande collectieve ervaring die men duende noemt en die zich bovendien altijd onaangekondigd voordoet, duidelijk te definiëren en vast te leggen. juist daarom is de tekst van Lorca en de film van Gieling zo wonderlijk. Zij lijken beide dat onmogelijke toch voor een groot deel mogelijk te maken, alsof er toch een taal bestaat die. zo’n begrip als duende kan naderen. Tekst en film zijn tegelijkertijd glashelder en duister, tegelijkertijd analytisch en lyrisch. Een dubbelheid die men niet vaak tegenkomt, maar die hier precies op zijn plaats is. Lorca neemt in zijn lezing soms zijn toevlucht tot raadselachtige, fascinerende metaforen. Maar steeds op tijd is er een anecdote, een uitspraak van een danser, of een meestergitarist, waardoor de duende wordt geworteld in een alledaags bestaan van mensen van vlees en bloed. Gieling lijkt eenzelfde tactiek te hanteren. 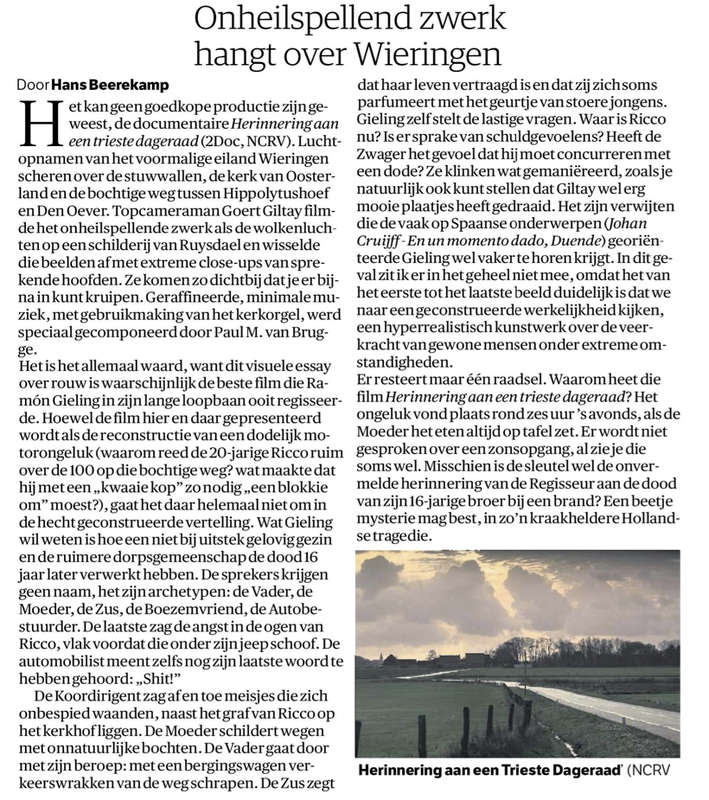 De grotere rijkdom aan mogelijkheden om niveaus van tekst, gesproken woord, muziek en beelden over elkaar heen te schuiven maken de film weliswaar iets complexer, maar dat wordt ruimschoots gecompenseerd door de mogelijkheid van film om de mensen en hun zang, dans, of gevecht met de stier ook ‘werkelijk’ op te voeren. Duende is gebaseerd op het bekende, heldere principe van herhaling en variatie. Wat steeds terugkeert is de tekst van Lorca, waaruit specifieke vertolkers (een zanger, stierenvechter, enzovoort) fragmenten voorlezen die betrekking hebben op hun eigen uitdrukkingsvorm. We krijgen zo de tekst van Lorca in fragmenten aangeleverd, maar steeds via een andere stem, een andere verankering, waardoor de woorden didactisch worden gekoppeld aan personen die de duende kennen. De fragmenten van Lorca’s tekst zetten we zo als (nu levende) legostenen op elkaar, waardoor steentje voor steentje het begrip wordt uitgebreid. De werkwijze is zo niet die van een steeds nauwkeuriger definiëren, maar van een uitbouwen, opstapelen. Het ‘steeds meer’ levert dan wel niet iets preciezers, gerichters op, maar wel dat het begrip ons nader komt (ook in de betekenis van iemand na staan: we gaan het begrip aantrekkelijk, verleidelijk, fascinerend vinden). En daar tussendoor wordt deze analytische arbeid voortdurend onderbroken door verleidelijke momenten waarin wordt gezongen, gedanst en uiteindelijk een ‘faena’ uit een stierengevecht wordt getoond. Maar ook deze zang en dans wordt geworteld in echte individuen. Ze zijn niet vast- gelegd in de door toerisme overspoelde cuevas van Granada, of in een prestigieuze balletsetting zoals we die kennen uit de films van Carlos Saura, maar in een letterlijk alledaagse omgeving, in de smederij van een van de zangers, voor het huis (op de achtergrond twee kinderen die aan tafel toekijken), bij een vuurtje in een olieton op een verzamelplaats van oud ijzer. Zo wordt dit abstracte begrip voortdurend geïndividualiseerd, geworteld in mensen waarbij men ‘ervaringen’ kan vermoeden. Als toeschouwer van Duende heb je steeds het gevoel dat je het begrip gestaag nadert. Zowel analytisch als lyrisch, in verhelderende woorden en in de lyriek van mensen en land- schappen (waar anders zou men zich dit alles kunnen voorstellen dan in deze geschroeide aarde?). Zo gaat de film niet recht op zijn doel af, maar de cirkel sluit zich wel steeds nauwer. Dat is niet gering, voor een project dat men in eerste instantie voor onmogelijk zou houden.